Guru Raj Kaur is a Senior KRI Certified Level I and Level II Teacher Trainer. 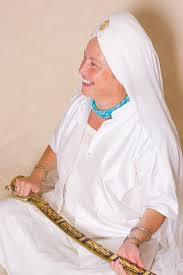 She was one of the first Kundalini Yoga Teachers in Canada over 42 years ago and an original student of Yogi Bhajan. She is Lead Trainer of the renowned Vancouver Aquarian Teacher Training program, now in its 24th year, and travels internationally as a guest Trainer. She has served for many years on the KRI Teacher Training Executive Council, developing this international KRI Aquarian Teacher Training Program. Guru Raj Kaur is Founder and Director of Yoga West, and the delightful Khalsa Ladies Camp held annually in B.C. Guru Raj Kaur is wife and mother of 2 daughters (also Kundalini Yoga teachers! ), and is well-known as an accomplished sacred musician. She delights in being part of creating Aquarian Teachers and sharing this sacred technology in an integrated and authentic way.